Miracles and Prophecies: Papal Mass attended by 3 million! CHRISTIAN MIRACLES IN OUR TIME... CHRISTIAN PROPHECIES FOR OUR TIME. Papal Mass attended by 3 million! 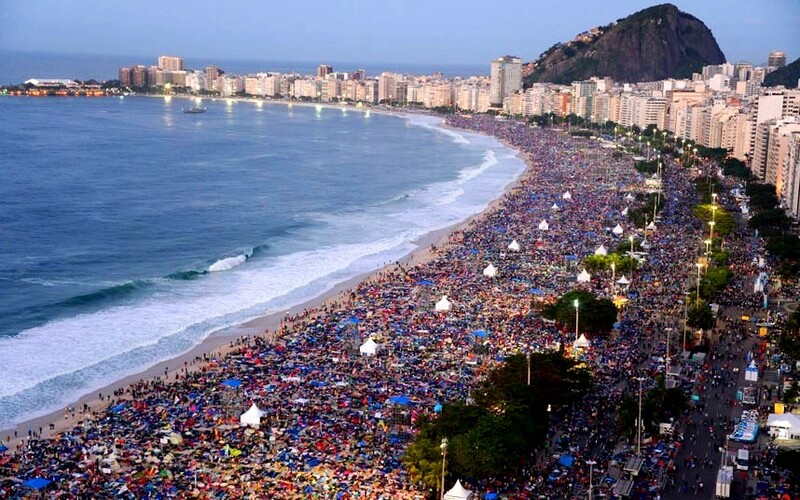 In Rio de Janeiro, Sunday, the concluding Mass for World Youth Day drew a reported congregation of 3 million. In an age when young people of faith are marginalized or ignored, even mainstream media must acknowledge the enthusiastically faithful, record audience. It seems that every time the Catholic Church is written off, it bounces back as strong as ever. and the gates of Hades will not overcome it. and whatever you loose on earth will be loosed in heaven. January, 2015 UPDATE: Record crowd of up to 7 million welcomes Pope Francis. Kenneth E. Nowell is a former lawyer, legislator and entrepreneur who retired early from career pursuits in order to focus on his Catholic faith. He now serves as sacristan, altar server and Eucharistic minister for the sick at his local church. Ken is the author of the Christian apocalyptic thrillers known as The Trials and Triumph Trilogy: The Rise, The Rebellion and The Return. Along with his wife, Elizabeth, he is also author of Rome and the Vatican - Guide 4 Pilgrims, which has often risen to #1 on Amazon's best sellers list for Vatican Travel Guides. The author's website can be found at www.KennethENowell.com. For more information on La Via Francigena, reporter Lyn Mettler recently featured this pilgrimage in The National Catholic Register. ++ A Rose Petal from Carmelo Cortez: Five Miracles? Video: miraculous image of Jesus Christ? The apparent miracles reported on this site may sound like fantasies but they are not. These phenomena - many of which I have personally witnessed - lead me to conclude that they are scientifically inexplicable. Likewise, many prophecies - from Scripture, saints and Christian apparitions - more than ever, resonate in today's headlines with clarity and certainty. apparitions rests with the Holy See of Rome, to whose judgment we willingly submit. All contents: copyright 2010 - 2015, Kenneth E. Nowell. Republication is authorized as long as no words are changed and www.MiraclesAndProphecies.com is referenced.